Do you have a fear of ghosts, anything ghoulish that goes bump in the night and causes fright? Well, if you do, then don’t worry because millions of others do, too. It’s a very common fear known as “phasmophobia”. The word “phasmos” derives from the Greek language referring to “phantom” or “supernatural being”. It’s also known as “spectrophobia”. “Spectrum” is Latin referring to a specter, or an image of a thing, or an apparition. Symptoms of phasmobia can typically be found in most disorders that lead to anxiety. A sufferer can go through feelings of dread, rapid heartbeat, panic attacks, also nausea and severe vomiting. It’s even been reported that a person suffering from phasmosphobia can develop OCD (obsessive compulsive disorder) in order to conduct rituals to negate any kind of ghostly presence. However, one can find treatment for such a fear. Self help methods can be extremely successful by reaching out to someone to openly talk about it to help eradicate the phobia by facing it. Another way is to contact professional help so that the phobia of ghosts can be removed. I always suggest to anyone who believes they’re experiencing any kind of ghostly activity to contact their local paranormal investigative team. It’s been from my own experiences that I’ve found these teams are compiled of members who are intelligent, non-judgmental and extremely open-minded, and are very willing to help to the best of their ability. Many of my friends are paranormal investigators and I always feel comfortable and at ease when working with them. Also, the relaxation method of meditation (which I highly recommend) can help calm one’s inner turmoil, creating more focus, therefore a sense of confidence to bring forth a well-balanced mental state of mind. And…. having a close relationship with one’s spirit guide is something else I recommend. I work very closely with mine and by doing so, I have absolutely no fear. There’s even a “specific phobia” involving a ghastly fear of mirrors. This macabre phobia is referred to as “catoptrophobia” which derives from the Greek language for the word “mirror”. 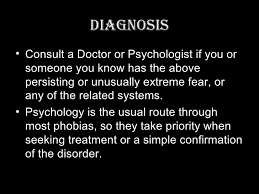 Now I mentioned “specific phobia”, which simply refers to any type of anxiety disorder that signifies an illogical fear of the exposure of a specific item and/or situation which can eventually lead to the distressed individual avoiding all contact with the item and/or situation. The fear can actually be so paralyzing to the individual’s mental state that it literally disrupts their life. Here are a few more phobias that I found to be rather interesting. Achluphobia: which is the fear of darkness. Eisoptrophobia: which is the fear of one’s own reflection. Samhainphobia: which is the fear of Halloween. And…. Wiccaphobia: which is the fear of witches and/or witchcraft. The last phobia I had to include. Why? Because of my own personal beliefs and spiritual journey. I am Wiccan, a solitary one who practices the use of white magic, and there’s definitely no reason to fear anything I do. I only believe in promoting love and light. I am well aware of those who practice dark magic, and I also stay away from them. But that doesn’t mean that I fear them. It’s easy to fear that which one doesn’t understand. It takes strength, courage and faith to overcome adversity.